The White Rabbit Slot by Big Time Gaming was released in 2017. Big Time Gaming is known for its high quality video slots. 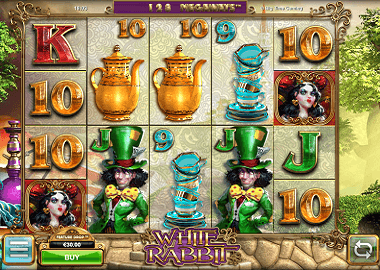 The White Rabbit Slots can be played on the desktop, smart phones and tablets. Also here and can test the game for free, more information below. Anyway – White Rabbit is a so-called Megaways slot. You play on 5 reels with up to 7 symbols each. With every spin you have a different number of symbols and thus always different ways of winning. The result is that you have up to 16 807 ways to win can. The symbols at the White Rabbit Slot are from the fairytale Alice in Wonderland. The low paying symbols are as always the playing cards 9, 10, J, Q, K and A. The Red Queen is the best symbols and in a 5-pack you get 25x your stake. There are also these icons: the twins, the cat, the hater, the pot of tea and the dodo. The White Rabbit symbol is your scatter, the cupcake symbols only appear in the bonus round and the feature drop symbol. Alice is your wild symbol and replaces all other symbols. The wild symbol can land on all reels except reel 1. There are 3 very nice bonus features on the White Rabbit Slot: Caterpillar Feature, Free Spins Bonus and the feature drop bonus. Trigger the Caterpillar feature with 4 bonus wild symbols on your reels. Your winnings will then have a multiplier of 2 or 3. All symbols except your scatter and feature drop symbol will be replaced. Free Spins Bonus: The Free Spins feature on the White Rabbit Slot can you activate with 3 scatter symbols on the 3 middle reels. You will get 15 free spins and now it will be really interesting for you. These are not normal Free Spins. Watch the cupcake icon. Every time that lands on your reel you get an additional symbol on this reel. You can play up to 12 symbols per reel. Thus you have in the free games up to 248832 ways to win – top profits are possible here! Moreover, you can get up to 75 free spins. Feature Drop Bonus: The feature drop bonus is a feature that only exists on big time slots. With this feature, you can “buy” your Free Spins Bonus. Look at the right hand corner of the screen. There is a Feature Drop Button with the amount you have to pay for the Free Spins Bonus. You can also collect feature drop symbols. Each time the amount for the free spins feature is smaller. If the amount is zero, the Free Spins feature starts automatically. As you’ve probably already noticed, the White Rabbit Online Slot is a very interesting game and you absolutely have to try it. Big Time Gaming slots are not as common in online casinos asMicrogaming, Playtech or Netent slots. Either way, we have some online casinos below which are recommendable. Join them and grab some good bonuses. By the way, at Videoslots Casino you’ll find the largest selection of slots ever: more than 2300 slots from more than 50 providers. Alternatively, you can of course play the White Rabbit Slot here with us for free. Click on the banner above and the game starts. When you want to play more Videoslots for free, join this site.